"When we first arrived, we were so excited to see such a mode..."
Have a question for Orion Residence? "The kitchen is well equipped with kitchen utensils, microwave, toaster and large fridge"
"the place was amazing and safe!" "House was amazing too, everyone is happy!" 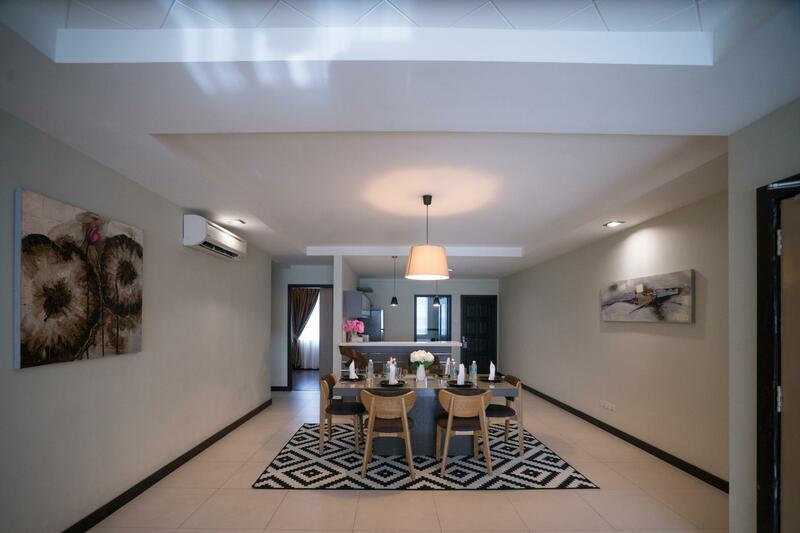 "Beautifully furnished 3 bedrooms,2 toilets, separate wet & d..."
Situated in the Tanjung Aru area, ORION RESIDENCE @ TANJUNG ARU is the perfect place to experience Kota Kinabalu and its surroundings. The property is just 3KM away from the city center, and it normally takes about 5 minutes to reach the airport. With its convenient location, the property offers easy access to the city's must-see destinations. ORION RESIDENCE @ TANJUNG ARU offers many facilities to enrich your stay in Kota Kinabalu. The property offers access to a vast array of services, including free Wi-Fi in all rooms, 24-hour security, daily housekeeping, grocery deliveries, portable wi-fi rental. The property's accommodations have been carefully appointed to the highest degree of comfort and convenience. In some of the rooms, guests can find complimentary tea, dressing room, towels, wooden/parqueted flooring, clothes rack. Throughout the day, you can enjoy the relaxing atmosphere of the outdoor pool, garden. ORION RESIDENCE @ TANJUNG ARU is an ideal place of stay for travelers seeking charm, comfort, and convenience in Kota Kinabalu. "Overall it was a very nice stay." A security deposit of MYR 300 is required upon check-in for charges or damages during the stay and will be refunded upon departure. Very worth it,nice very privacy location and suitable for family trip. Overall it was a very nice stay. However it would be more convenient to rent a car or uber to the city centre. We had some issues with the wifi, the connection seems to be cut off at night from 10pm onwards. Besides that, the place was amazing and safe! House was amazing too, everyone is happy! When we first arrived, we were so excited to see such a modern beautiful condominium. It is so spacious. Beautifully furnished 3 bedrooms,2 toilets, separate wet & dry kitchen, and separate laundry. The kitchen is well equipped with kitchen utensils, microwave, toaster and large fridge.The beds were comfortable. Shower was good. There is swimming in the compound. Ample parking spaces. There 2 lifts, the small one only fits 2 persons & 3 bags!! The main entrance doors are locked at night. It is located near the Tanjung Aru beach & KKIA. There is a supermarket nearby. You need a car to travel around, but the condominium is worth a stay. It can fit 6-7 adults. Definitely will come back! 탄중아루 해변 근처에 고급빌라 리모델링 된곳인데 택시는 잘 못찾드라구요 ㅎㅎ 새벽에 도착했는데 입구 문부터 잠겨서 겨우 들어갔어요 ㅠㅠ 엄청 넓고 내부 숙소는 너무 좋아요 고급 빌라입니다. 여자 2, 남자1명. 20대 초반 친구들끼리 여행가서 싼 가격으로 찾다가 예약하게 되었습니다. 일단 화장실이 2개이고, 6인용 방이라 넓다는 점이 좋았구요, 언제나 이용할 수 있는 수영장도 적당히 크고 깨끗하게 유지되는 점이 좋았습니다! 가격대비 매우 만족해서 다음번에도 친구들과 간다면 다시 예약하겠다는 말도 나누었어요. 체크아웃시 짐 보관 할 수 있다는 점도 좋았습니다. 직원분들도 친절하셨고, 가끔 프론트에 없으셔도 서성이고있으면 금방 나와 주시더라구요ㅎㅎ 친절하셨구요! 시내에서 멀리있다는게 단점일수있지만 그랩이 잘 잡히고 이용비가 워낙 싸기때문에 한번도 불편함을 느낀적이 없었어요, 가끔 숙소 위치를 헷갈리시는 기사분들이 있긴했지만 구글지도 잘 활용하시면 충분히 설명 가능했습니다. 단점이라면 숙소내에 먹거리를 살 마트가 없다는 점, 머리위에 고정된 샤워기, 넓어서 그런가 구석 부분은 약간 청소를 소홀히 하는면이 있긴했지만 다들 무난히 넘어가는 성격이라서 그런지 신경쓰일 정도는 아니었어요. 예민하신 분들이라면 신경쓰일수 있긴 할거같아요. 벌레는 딱 한번 마지막 날에 작은 무당벌레 같이생긴거 하나 봤어요. 벌레를 많이 무서워하는데 벌레 걱정없이 충분히 만족할 정도였습니다! 방이 진짜 넓고 깨끗하고 생긴지 얼마 안됐는지 좋았어요 근데 콘센트 작동이 안되는 데가 많았어요 10개중 1개가 작동될까말까 .. 방 키도 열쇠이고 정문도 문 하나여서 안전이 걱정되긴합니다. 그랩 아저씨도 밤에 이 곳 데려다주면서 가로등 하나 없는 콘도 앞 도로보고 절대 밖에 나가지말라며 위험하다며 경고하셨어요 밤에는 무서워서 창문 다 잠구고 잤습니당 ㅠ 콘센트랑 보안빼고는 아주머니도 너무 친절하구 좋아요 !!!! 여기 이용하실거면 멀티탭 꼭 챙겨가세여!